Tue Jul 19, 2016 5:05 pm Hello From a Second Gen. Sat Jan 18, 2014 11:30 pm Re: the next lil Ootmik! Sun Jul 26, 2015 12:15 pm Re: whatcha doing? Thu Jan 16, 2014 7:43 am Audition tonight, wish me luck!! So one of my Ma's retirement pastimes is painting china. Lots of flowers and such. 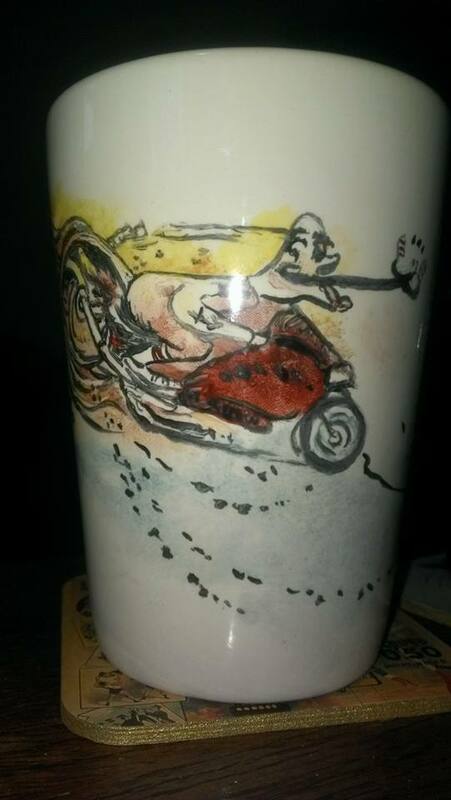 So I suggested she check out Ralph Steadman and she painted this coffee cup for me. I have the coolest Mom ever. Tue Aug 26, 2014 7:41 am Re: Stacious. Thu Oct 01, 2015 4:51 pm Re: 0 - 170mph in 30 days! Tue Feb 16, 2016 7:21 pm Poppa's got a brand new bag. guitargeek wrote: This is when public surveillance footage would come in handy.